Here’s a creative little gardening project that is perfect for early spring. 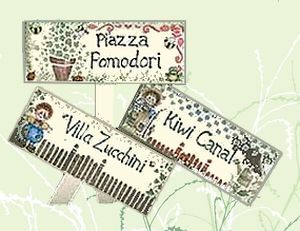 As you are planning your vegetable or flower gardens, why not prepare some pretty little row markers (or plant pokes) to identify the seedling beds? First you need to make the wooden stakes. Apply glue to a craft stick and centre it on a rectangle piece of wood, leaving the bottom of the stake long enough to insert into the ground. Let the glue dry and then add a staple through the two pieces of wood for extra security. Bend the pointed staple ends into the wood. Paint your stakes completely, applying as many coats as required to cover. Allow the paint to dry. Using your stencils, add a little fence (if you have talent, you can paint these free hand), a watering can, flowers, etc. My talents are not in painting, so I used stencils and rub on transfers. Dip a sponge in a paint colour of your choice and gently tap the outside edge (with the sponge) of the rectangle piece to add a little extra colour. Apply any rub on transfers. Apply a couple of coats of clear coat or varnish to protect your stakes from the weather. I didn’t want the standard names on my stakes, so I added a little extra to the titles. Have fun and be creative with your titles. Hubby, son and I had great fun coming up with names for our veggies.